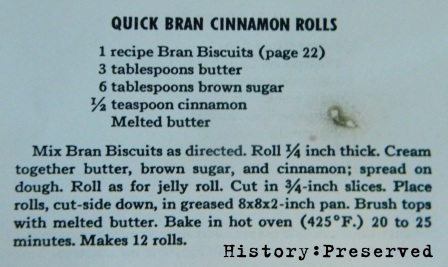 Let's take a quick moment to ponder the title of this 1940 recipe from the Kate Smith's Breakfast Book for Quick Bran Cinnamon Rolls. Is this recipe quick? Meh. With bran. Okay, still yum! 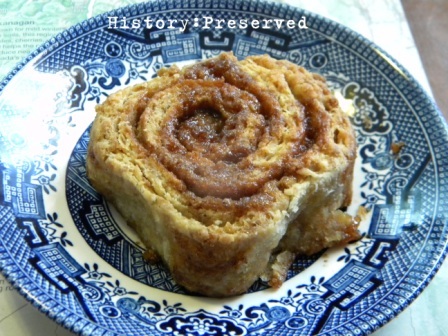 The recipe consists of making the Bran Biscuits and modifying it into cinnamon rolls. Not a weird concept by any means. 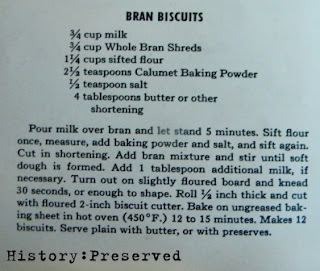 The Bran Biscuits call for Whole Bran Shreds. I have no idea what those are, and I don't think you can get them anymore. They don't sound very appetizing. 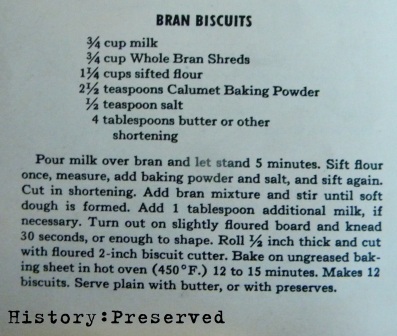 Anyway, to substitute I used Bran Flakes. I love eating bran flakes with raisins. (Not Raisin Bran. 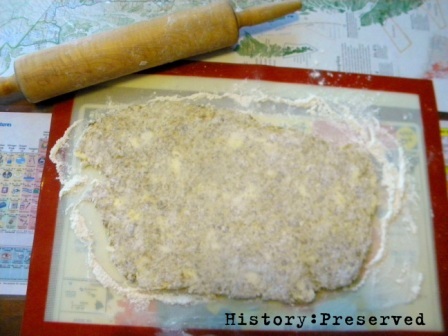 Coating raisins in sugar is just gross and redundant.) When I get to the bottom of the bag, instead of forcing myself to eat the flake dust at the bottom to salvage the few remaining whole flakes, I dump it into a container to save for recipes such as this one. They worked perfectly! A recipe of Bran Biscuits rolled out and ready for the butter/cinnamon/brown sugar mixture. The recipe is really straightforward. Nothing too fancy going on here. I didn't take a picture of them before being baked. I was in too big of a hurry to eat them already! And need I say how yummy they were? I say were, because they have gone the way of all things amazingly tasty. My whole family loved them. If you're going to have biscuit cinnamon rolls, you might as well get the bran on and make these! I can't say they look really impressive, but it's the flavor that counts with these babies!